How far along? 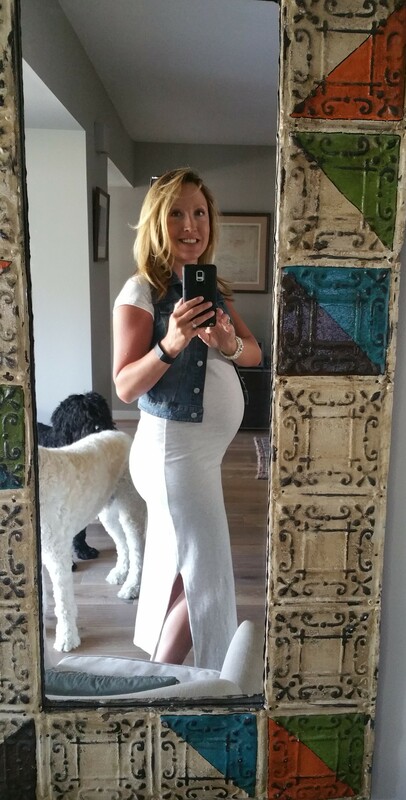 28 weeks – officially in the 3rd trimester! Baby’s size: around 14.8 inches long (compared to a chinese cabbage) and about 2.25 pounds. Apparently I had the wrong week’s info last week. I’ll get a better idea of the babies actual size when I have my ultrasound Monday the 11th! Clothes: Long jersey maxi dress from Noah and Bowie. My sleeveless denim jacket is from Target. Symptoms: I have new pain this week…pain in my low tailbone. I can’t sit straight it’s so bad. I have to sit sideways. Spinning is uncomfortable unless I lean forward and that’s getting harder because of my belly. I don’t want to give it up! I think I’m also getting the “pregnancy mask”. I have multiple dark spots on my cheeks that we’re there before and that’s a classic area to be affected during pregnancy. In other news, don’t have the linea nigra yet. According to this article, not having it may mean that I have plenty of folic acid! Movement: Almost got my moving belly on video the other day but the baby stopped moving by the time I reached for my phone and started the video. What I’m eating: Craving shrimp, crab cakes and calamari like crazy. Coconut on everything. Fruit: this week it was navel oranges, cherries, banana and blueberries. I made chicken enchiladas with black beans and served them up with lots of avocado that had lime juiced squeezed all over it and salsa of course…so yummy! Drinking: Milk. Kombucha. Water. Unsweetened iced tea with lemon. Nepresso decaf coffee. Looking forward to: My appointment for ultrasound, glucose and regular check up on Monday the 11th feels like it will never get here! !